Abshire’s group has developed a suite of sensors for monitoring cells cultured on the chip surface in various ways. We fabricate MEMS structures over these, and do the packaging. This is essentially a camera without lenses that can be used to image the positions of cells on its surface. 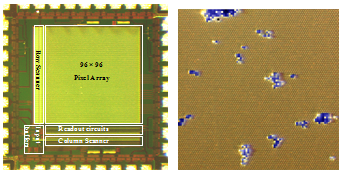 This chip has an array of 96 x 96 pixels. 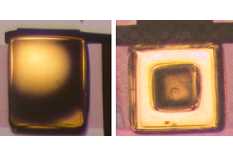 The figure on the above right shows an overlay of the imager signal (blue) with a microscope picture of the chip surface. Work done by H. Ji, D. Sander, and A. Haas under P. Abshire. H. Ji, P. A. Abshire, M. Urdaneta, and E. Smela, "A CMOS contact imager for monitoring cultured cells," IEEE Int. Symp. Circuits and Systems (ISCAS05), Kobe, Japan, p. 3491 - 3494 (23-26 May, 2005). H. Ji, D. Sander, A. Haas, and P. Abshire, "A CMOS contact imager for locating individual cells," IEEE Int. Symp. Circuits and Systems (ISCAS06), Kos, Greece, p. (submitted abstract) (May 21-24, 2006). 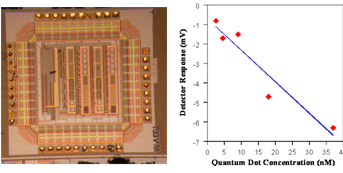 This photodetector chip has low-noise, low-light active pixels. Our goal is to be able to image faint fluorescence, such as from single cells. See the section on integrated fluorescence sensing. Work done by H. Ji, M. Dandin link to people page, and D. Sander under P. Abshire. H. Ji, M. Dandin, E. Smela, and P. Abshire, "Integrated fluorescence sensing for lab-on-a-chip devices," IEEE/NLM Life Science Systems & Applications Workshop, Bethesda, MD (July 13-14, 2006). S. B. Prakash, N. M. Nelson, A. M. Haas, V. Jeng, P. Abshire, M. Urdaneta, and E. Smela, "Biolabs-on-a-chip: monitoring cells using CMOS biosensors," Proc. IEEE/NLM Life Science Systems & Applications Workshop, Bethesda, MD (July 13-14, 2006). M. Dandin, P. Abshire, and E. Smela, "Optical filtering technologies for integrated fluorescence sensors," Lab Chip, 7 (8), 955-977 (2007). H. Ji, D. Sander, M. Dandin, E. Smela, and P. Abshire, "Integrated fluorescence sensor for UV-excitable fluorescent probes," IEEE Transactions on Circuits and Systems I (in preparation) (2007). 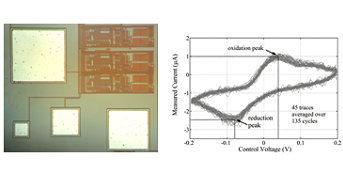 D. Sander, M. Dandin, H. Ji, N. Nelson, and P. A. Abshire, "Low-noise CMOS fluorescence sensor," International Symposium on Circuits and Systems 2007 (ISCAS07), New Orleans, LA, USA, p. accepted for publication (May 27-30, 2007). Healthy adherent cells stick closely to surface. 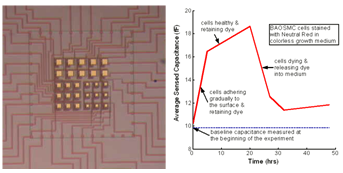 One can use capacitance to sense the proximity of the cell, and thus to monitor cell viability. We are able to use capacitance sensors to track cells settling onto the surface when they are initially introduced, functioning spreading normally, and dying. Work by S. B. Prakash under P. Abshire. 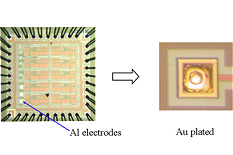 S. B. Prakash, P. Abshire, M. Urdaneta, and E. Smela, "A CMOS capacitance sensor for cell adhesion characterization," Int. Symp. Circuits & Systems (ISCAS05), Kobe, Japan, (IEEE), vol. 4, p. 3495 - 3498 (23-26 May, 2005). 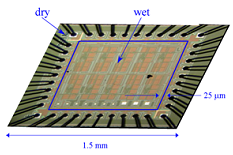 S. B. Prakash and P. A. Abshire, "A CMOS capacitance sensor that monitors cell viability," Proc. IEEE Sensors Conference, Irvine, CA, p. 1177-1180 (Oct. 31-Nov. 3, 2005). 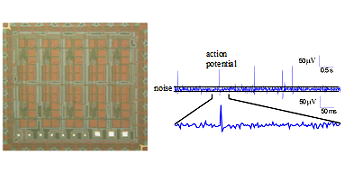 S. B. Prakash and P. A. Abshire, "On-chip capacitance sensing for cell monitoring applications," IEEE Sensors J., 7 (3), 440-447 (2007). The bioamplifier chip detects the extracellular currents generated by electrically active cells, such as muscle cells and neurons. It filters and amplifies the signal before sending it off chip. P. Abshire, J.-M. Lauenstein, Y. Liu, and E. Smela, "Cell clinics for bioelectronic interface with single cells," IEEE Int. Symp. Circuits and Systems (ISCAS03), Bangkok, Thailand (May 25-28, 2003). This is not a sensor, but a circuit developed to drive electrochemical reactions on on-chip the electrodes (appearing silver-colored in the image). This has been used to control the actuation of PPy deposited on the working electrode, and will be used to control lid position. S. B. Prakash, P. Abshire, M. Urdaneta, M. Christophersen, and E. Smela, "A CMOS potentiostat for control of integrated MEMS actuators," Int. Symp. Circuits & Systems (ISCAS06), Kos, Greece (May 21-24, 2006). S. B. Prakash, M. Urdaneta, M. Christophersen, E. Smela, and P. Abshire, "In situ electrochemical control of electroactive polymer films on a CMOS chip," Sens. Act. B, 129 (2), 699-704 (2008). 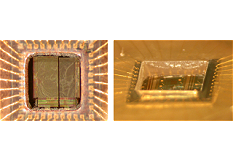 Methods for fabricating lidded vials on the tiny CMOS chips were developed by Yingkai Liu and continued by Marc Christophersen. Photographs of actual chip surfaces covered with vials and as-yet-unreleased lids are shown here, with an overview and a close-up. The circuitry can be seen as pink features under the MEMS structures. The lids are the gold-colored rectangles, the PPy on the hinges (and covering the leads) appears black, and the vials are transparent. Electrodes for recording action potentials are inside the vials. Photos taken by Marc Christophersen. Figures of a lidded vial with the lid open and closed are shown here. A cell can be seen inside the open vial. The pink color of the fluid is from the neutral red cell viability dye. A sketch of these structures is shown here. The CMOS chips arrive from the manufacturer with aluminum electrodes. Since Al is not biocompatible, it is covered with Au by electroless plating. The techniques we use were developed by Mario Urdaneta. The challenges of packaging these chips are 1) the small distance between the bond pads, which must remain dry, and the chip surface, which must be exposed to the cells and the cell medium and 2) the bond wires rising by more than 100 mm above the chip surface. We are currently using Loctite 3440, a photopatternable adhesive, which can last for a couple of weeks in an incubator before failure. The figure shows overhead and oblique views. We are pursuing other packaging methods to improve the lifetime. R. Delille, M. Urdaneta, S. Moseley, and E. Smela, "Benchtop polymer MEMS," J. Microelectromech. Syst., 15 (5), 1108-1120 (2006).